The next OPEC meeting is on May 25, 2017, and the fate of the cartel's oil production cap is at stake, making this the most important meeting since 2014. Meeting in Vienna, OPEC has to decide whether it will keep a lid on oil production or let its members produce as much as they want. Right now, the cartel has limited production to 32.5 million barrels a day in an attempt to boost prices. Whatever decision OPEC reaches on May 25 will have a dramatic impact on crude oil prices. Crude oil prices have plunged 5% since the start of the year. WTI crude oil now trades at $46.45 a barrel, its lowest point in 2017. If OPEC extends its cut, oil prices could rise again. But if OPEC fails to renew its production cut, oil prices could fall even lower. Like any other commodity, the law of supply and demand dictates oil prices, and OPEC is the only organization that can manage the supply of oil. OPEC is an organization of 13 oil-exporting companies who agree to manage oil production together. 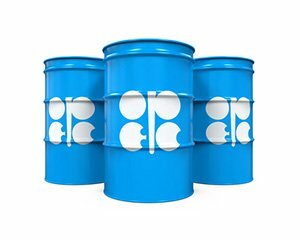 OPEC collectively decides how much oil to produce to manage oil prices, thus helping its oil-exporting members. The cartel can cut oil production to boost oil prices – making its exports more valuable – or it can cap production to ensure price stability. On Nov. 30, 2016, OPEC reached its first deal to cut oil production since 2008. The deal cut oil production from OPEC members by 1.2 million barrels a day. The cartel also got the help of 11 other non-member countries, including Russia, to cut another 600,000 barrels of oil a day. The November OPEC deal sent oil prices soaring. 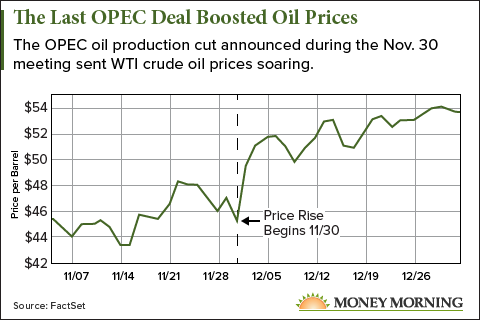 Between Nov. 30 and the end of the year, crude oil prices surged 16%. This was the most significant OPEC decision since November 2014, when the cartel chose not to cap production despite falling prices. Oil prices slid 55% between December 2014 and January 2016. But higher oil prices encouraged more American oil production. Unlike OPEC countries, firms in the United States are free to produce as much oil as the market dictates. Higher oil prices mean American oil producers can make a bigger profit, so they produce more oil. When prices climb, more difficult to reach (and expensive) oil becomes profitable. In fact, American oil production has risen 7% since OPEC announced its last deal. Since oil prices hit $53 a barrel on April 11, oil traders have pushed prices down as a steady barrage of data shows American production rising. For example, the last Baker Hughes rig count on April 28 showed the United States added 13 oil rigs, bringing the number of active rigs up to 697, its highest total in over two years. Oil prices have fallen 8% since the last rig count came out. With the American production boost pushing oil prices lower, OPEC has to decide if it's willing to keep sacrificing its output in favor of higher oil prices. If OPEC scuttles the deal, oil prices could plunge, and if it renews it, oil prices could rise again. With oil prices trading near where they were on Nov. 30, this deal is even more important than the original one. If OPEC can't stick to a production cut long enough to keep oil prices up, then the cartel only proves it is useless. Will OPEC Reach a Deal? Sure, governments aren't hammering the consumer enough yet with taxes and price gouging. Just what we need. The Mafia cartel trying to push oil higher. These guys along with all the other people with their hands in the pie need to take a beating. It would serve them all right. I despise OPEC and its members. They refuse to share their wealth and it goes to the top 1%. Of course who pays for it. Us. After 100 years of price fixing, stealing and corruption these players deserve to pay the piper. Long overdue. Can OPEC cut production enough to raise the price of oil despite increased U.S. production?